If you’re a caregiver you probably believe that you have to do it all You believe that no one will care for your loved one like you. You might believe that there is no way out of the role of caregiving and that there few or no solutions to the present situation. You might be feeling hopeless, exhausted, or guilty for feeling angry about caring for a loved one. I walk in your shoes as a professional, caregiver and advocate every day. I understand. I’ve been a professional caregiver since 2000 helping caregivers and families like you. By the age of 40, I lost both parents, a sister, and a brother, grandparents, aunts, and uncles. Caregiving is like a roller coaster with continual ups and downs. Some days you might feel like giving up. Know that there are solutions to the feelings that you experience and the daily challenges trying to navigate the healthcare system, doctors, insurance companies, costs of care and more. Some days it feels like everyone is against you. There is hope and there are solutions to many of these common challenges. Many caregivers are embarrassed to share their feelings of anger, frustration and guilt. Yet, most caregivers would never walk away from the role of caregiving even though caregivers feel trapped and isolated. Care recipients also feel trapped: trapped by feelings of being a burden to family, of having to rely on others for daily care, and by health conditions that have left them struggling on a daily basis. Conversations about caregiving and care receiving are difficult, if not impossible. Many of you have tried to have a conversation and have been stopped by a loved one who is in denial or refuses to acknowledge that decisions have to be made. How many of you have parents or a loved one who assumes “you will always be the caregiver,” yet they never asked. Caregivers, now is the time to take back your life, to set boundaries, and to gain control of the care situation that has you feeling so out of control. Recognize early signs that loved ones will require special care and advocacy. Initiate conversations about sensitive mental and physical health issues. Acknowledge the challenges that caregiving brings to family interactions and relationships. Identify actions you can take to facilitate clear and open communication. Set boundaries that allow you to avoid burnout and not sacrifice your life and well-being. Gain awareness of the personal and financial obligations resulting from caregiving. TAKE ADVANTAGE OF UNBELIEVABLE SAVINGS OF $10.95 IF YOU ORDER MY BOOK, THE CAREGIVING TRAP: SOLUTIONS FOR LIFE’S UNEXPECTED CHANGES BY SATURDAY NIGHT AT 11:59 P.M. 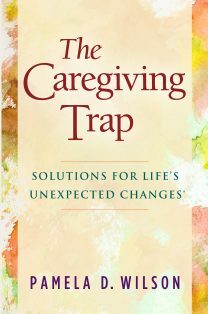 Yes, I want to receive The Caregiving Trap: Solutions for Life’s Unexpected Changes at a one-time retail price of $16.95 ($5 off regular retail) and with FREE SHIPPING (A $5.95 value) – a total savings of $10.95. No thanks, I’ll pass over the savings. I’ll buy the book later at the regular retail price of $21.95 plus $5.95 shipping if I’m interested.